The offical site of The Canadian Coyote Company Ltd.
New! Visit our online store! Snare/Trap Supplies - Visit our new webstore for a list of available products and prices. Our supply line has increased drastically from what we used to carry. We are continuing to bring in more products all the time. We gladly accept order by phone or email. We now carry two versions of the Magnum Spring, an "Economy Magnum" and "Deluxe Magnum". Improvements have been made to last years model and both springs are vastly superior. This spring preforms awesome on coyotes, especially when used with a properly made Lightning Lock. As well reports from numerous wolf trappers are coming that they are very pleased with this products performance on wolves! Be certain to position your triggers sideways on this spring, and clip to the "wire end side" of the spring. This will cause the spring loop or eyelet to flex, and will aid the device in positive firing. We do sell ready made snares and have a variety on hand. We also will build custom snares as per your specifications. Though not shown on our product pages, we do sell snares. We recommend a two piece snare, comprised of a 5' or 6' Alberta/Senneker Powersnare and a 5' or 7' extension cable, fitted with a swivel. Snares and extension cables are sold separately. All snares come with your choice of spring, snare lock, and are complete with the Senneker Powersnare Trigger. A setting tool is required to use our snare/system. All snares built by Canadian Coyote Company will be made with a premium grade cable which is extremely tough and able to do the job, regardless of your quarry. *** Do note: With our two piece snare system, you simply change out the replacement snare after each catch! You do not have to change out the whole snare and drag snare ends home to be rebuilt. A quick action of tying a replacement snare onto your extension cable and your snare location is back to 100% efficiency. To our way of thinking, the #9 Heavy Duty Wolf Swivel simply provides the user with an efficient, solid replacement snare tie off point. Animals are harvested so quickly that the functionality of the swivel is redundant, compared to the archaic systems of yester-year. The above photo depicts both the Deluxe Magnum and the Economy Magnum Stingers. They are exact in size and nearly exact in strength, however the deluxe version is made of a much higher quality steel and is designed to last. Do not confuse our Economy Magnum with the low quality knock off springs, it is still a good quality spring, but at a lower price. The photo above depicts the Alberta Powersnare Trigger with a #3 Trigger with a black powder coat finish on the left, and on the right is a #2 Trigger with an electroplate finish. Please allow us to explain the difference. Schematically, the #2 and #3 were supposed to have a slight variance but the manufacturer failed to build them different. The #2 and #3 Triggers were essentially the same and produced exact results, therefore we sold them randomly into the market. However, the #2 and #3 Triggers are different from the original trigger, they are manufactured more precisely and have a longer tip. Due to the newer triggers having a longer tip, Magnum springs should be used with the newer, numbered series triggers only.  The differences in plating are simply cosmetic. Check out our "New Line of Products" by clicking the buttons at the top of the screen to view our products lists under headings "TRAPS" "SNARE PRODUCTS" AND "FUR HANDLING". We are carrying more trapping supplies than ever before and more all the time. THE SPRING AND LOCK ARE THE "HEART OF THE WHOLE AFFAIR" WHEN IT COMES TO PROPER/HUMANE DISPATCH WITH THIS TYPE OF POWERSNARE. A POOR LOCK AND UNDERPOWERED AND/OR INFERIOR SPRING WILL LEND TO MIXED OR EVEN POOR RESULTS. WE ALSO RECOMMEND THAT YOU USE THE HIGHEST QUALITY CABLE WHEN SNARING WITH LIGHT DIAMETER WIRES ON COYOTE, WOLF, WOLVERINE. THOUGH MORE EXPENSIVE, LOSS IS GREATLY REDUCED COMPARED TO USING THE LOWER QUALITY, CHEAPER CABLE. WE ALSO RECOMMEND TONING DOWN THE SIZE OR CRIMPING OF YOUR BREAKAWAY DEVICE WHEN USING THE POWERFUL MAGNUM STINGER KILL SPRINGS TM. WE WILL TRY TO PRODUCE SOME MORE EDUCATIONAL YOUTUBE VIDEOS FOR MORE INFORMATION REGARDING THIS IMPORTANT ASPECT, THAN WE AS TRAPPERS CAN LEAD THE CHARGE IN RESPONSIBLE, ETHICAL, AND HUMANE SNARING. IT IS CRITICAL THAT AS TRAPPERS, WE ARE EDUCATED IN THE UNDERSTANDING AND PROPER USE OF THIS DEVICE. Recommended by renown wolf trapper, Paul Trepus on British Columbia. 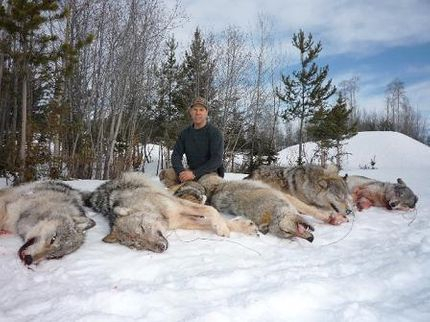 Trepus is one of Canada's most knowledgeable wolf men and has authored numerous instructional trapping videos such as "Wolf Snaring with Paul Trepus" which showcases the use of Stinger Kill Springs TM in conjunction with light cable. a humane snare device. Weak, poorly designed compression springs and such spring lock combinations are a poor choice when it comes to delivering true humane dispatch on animals that are taken in a less than ideal circumstances. The Stinger Kill Spring TM and Magnum Stinger Kill Spring TM are true torsion springs and are much more strong and far more efficient than the coily compression springs of yester-year. When using the magnum spring, the trigger position will affect positive firing of the spring. This device will work best when the trigger is positioned on the side of the spring. With the standard/regular/original spring, differing position of the trigger did not seem to affect firing performance.   However, this changes when the higher powered magnum is used. Inspect the photo on the left. Note on the loop of the magnum spring that we have three sides, we refer to them as the top, inside wire-end side (left side of spring loop), and the outside continuous wire side (right side of the loop). Definitely clip the trigger to the inside, wire-end side of the spring loop/eyelet. Doing so will cause the eyelet to flex and will aid the device in firing. Clipping the trigger to the top causes the device to fire harder and will result in mis-fires, clipping the trigger to the outside-continuous wire side will result in non-firing of the system. This system is designed to hold the spring closed until the snare has tightened in a sufficient manner on the animals neck. Once the snare has tightened up on the animals neck, the trigger will release from the spring. The lock holds the snare in place on one side while the spring applies massive tension to the snare at the opposite end of the loop, resulting in clean and humane dispatch. When setting the Alberta Powersnare, we recommend that you NOT tie your snare high as trappers did in the past with simple self locking snares that did not employ the use of killing springs or even simple dispatch compression springs. Tying your snares high, in such manner, helps animals entangle quickly which was desireable with the old/basic self locking entanglement snare; entanglement was generally necessary to accomplish snare dispatch. However with the modern Alberta Powersnare, entanglement can be detrimental to snare dispatch success; tying high can increase interference to normal powersnare function, as well, tying high can also reduce the ability of the device to fire due to the limbs flexing and acting as a shock absorber, thereby absorbing energies that are required to set the snare loop tight upon the animals neck and also absorb energies required to fire the trigger. Be also aware that the Magnum Stinger Kill Spring TM is a much stronger device than the standard Stinger. Because of this fact, realize that Breakaway Device function is affected with a stronger spring, and we recommend that you use lighter breakaways on your snares than you did before. As the 265 lb Senneker Elite BAD is the lightest as well as most popular and successful s-hook BAD ever made and used with a kill spring, (this applies world-wide, including Saskatchewan!) we recommend that you not over-crimp the 265 when using magnum springs for coyote. We also suggest to trappers targeting the massive “eastern coyote” that they experiment with the 265 lb Senneker Elite BAD with magnums for most effective deer release due to the new dynamic. WHICH WAY DOES THE TRIGGER GO? I am often asked this question, the trigger may point either direction and is simply a preference thing. DO I NEED WASHERS?    Washers are used simply to keep the end stop of the snare from being pulled through the eyelet of the spring. This is necessary only with the magnum spring. If the trigger is positioned opposite of what the above photo depicts, no washer would be needed.